Note: There is no Windows 7 driver for this hardware. This was the last driver for this hardware as it is very old and was never updated again. What you could try is running the driver in compatibility mode. 1. Place the driver installation file on the Desktop. 2. 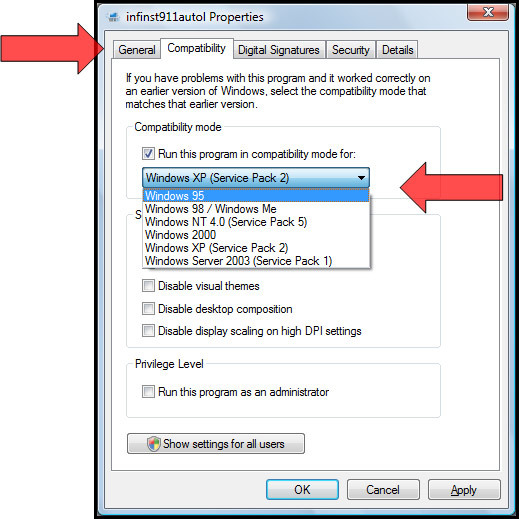 Right Click the driver installation file and select Properties/Compatibility Tab. 3. Select Windows XP for compatibility mode. 5. Right Click the file and select the Run As Administrator option to install. ** Still don’t understand how to run in Windows 7 and Windows 8 compatibility mode? I have written an explanation here which might be easier to understand. I have made the link RED for you to see. I have given a detailed explanation as to how to install old hardware drivers onto Windows 7 and Windows 8 machines on the website.